UPDATE: Saturday, July 9th, 5:00 p.m. – There’s supposed to be an open pocket of clear sky tonight, so Bob is going ahead with the Clark Reservation session. As a bit of advanced warning, Bob was informed late yesterday that Clark Res may be charging a $5 admission fee to the park for the event (due to the +75 people we had last year). UPDATE: Friday, July 8th, 4:00 p.m. – Tonight’s Clark Reservation session has been rescheduled to tomorrow (Saturday, July 9th) due to cloud cover. Update to follow Saturday afternoon. In the interest of a little more advanced notice for scheduled events, this page is meant to help you get your own schedules synchronized with upcoming nighttime and solar sessions hosted by Bob Piekiel (with his fellow CNYO’ers serving as wing-observers). Pending additional announcements, the list below fills out his Summer Roster (now with meetup.com and Facebook Events included). The attending crowd at last summer’s Clark Reservation session. For the record, seven sessions in two months counts as a whole lot of fantastic CNY astronomy outreach! 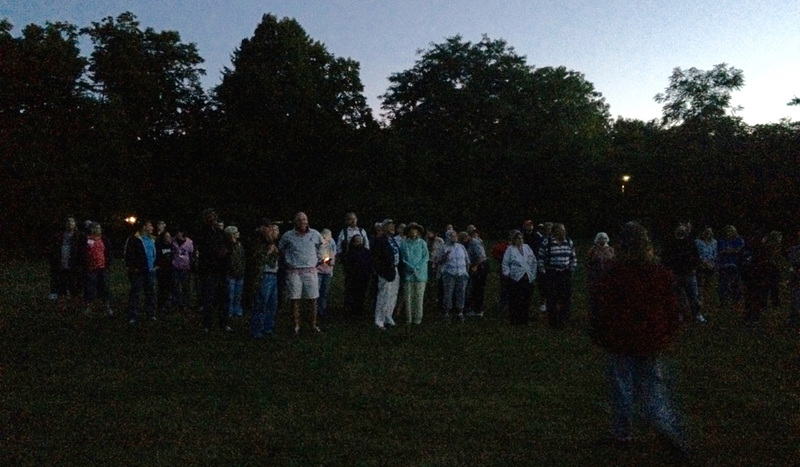 July 8/9 – Bob Piekiel @ Clark Reservation, 8:00 – 10:30 p.m.
Planets, stars, and a crescent moon! The summer skies are at their finest, when we can look directly into the center of the Milky Way galaxy, and see it’s many rich star clusters and nebulae. Venus, Jupiter, Saturn and Mars will be visible. We might even get a peek at Mercury. July 22/23 – Bob Piekiel @ Baltimore Woods, 9:00 – 11:00 p.m.
Summer skies at their finest, with the many rich star clusters and nebulae visible in the direction of the heart of our Milky Way galaxy. Venus, Jupiter, Saturn and Mars will be visible. July 29/30 – Bob Piekiel @ Green Lakes, 8:00 – 10:30 p.m. The summer skies are at their finest, when we can look directly into the center of the Milky Way galaxy, and see it’s many rich star clusters and nebulae. The Delta Aquarids meteor shower peaks that night, and Venus, Jupiter, Saturn and Mars will be visible. We might even get a peek at Mercury. August 12/13 – Bob Piekiel @ Baltimore Woods, 8:30 – 11:00 p.m. The annual persied meteor shower, one of the year’s finest. Bring a blanket or lawn chair to recline on while not looking through a telescope. Great views of the summer Milky way, with the planets Mars Jupiter, Venus and Saturn visible. August 13/14 – Bob Piekiel @ Clark Reservation, 1:00 – 3:00 p.m. Solar program! Using special telescopes, come and see solar flares, prominences, sunspots, and magnetic storms on our nearest star, the Sun! August 26/27 – Bob Piekiel @ Green Lakes, 7:30 – 9:30 p.m.
Summer skies again, Plus a stunning conjunction of Jupiter and Venus in the west on those nights, and Mars and Saturn also. August 27/28 – Bob Piekiel @ Baltimore Woods, 1:00 – 3:00 p.m. SOLAR VIEWING PROGRAM. Using special telescopes, come and see solar flares, prominences, sunspots, and magnetic storms on our nearest star, the sun!